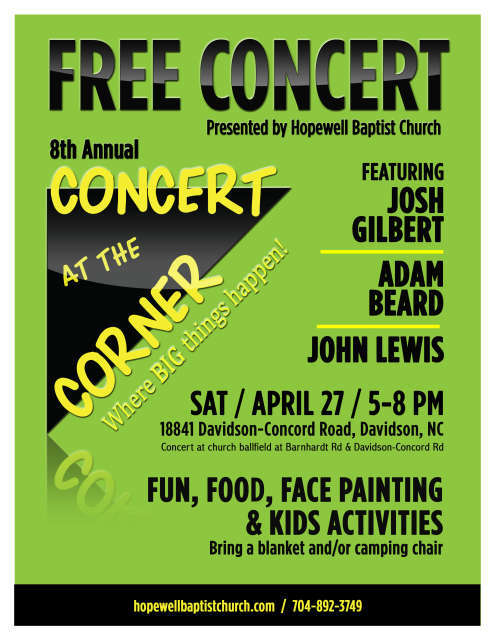 Hopewell Baptist Church is hosting our 8th Annual “Concert at the Corner” Community Event at the Church Ballfield on Saturday, April 27th at 5:00 p.m. The event is open to all ages. 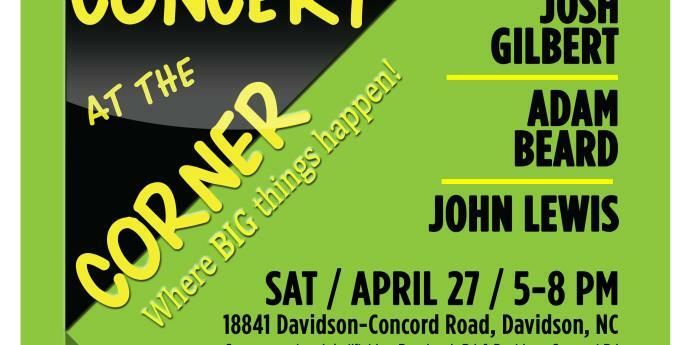 The concert will showcase three musical performances by Josh Gilbert, Adam Beard and John Lewis. There will be activities for the children, including inflatable bounce houses and slides, games and face painting. We will have hamburgers, hot dogs, chips, popcorn, drinks and snow cones. Bring a blanket and/or lawn chair and join us for an evening of good music, food, fun & fellowship. The event & food are all free. The Church is located at 18841 Davidson-Concord Road, near the main entrance to the River Run Golf Community, in Davidson. The Ballfield is behind the Church, at the corner of Davidson-Concord Road and Barnhardt Road. Josh Gilbert is a Singer-Songwriter & Band, with a sound drawing from Americana music and a variety of genres. Josh’s influences can be placed somewhere along Adult Contemporary Acts such as NeedToBreathe, Johnnyswim, Train & even classic rock such as U2 and The Allman Brothers. Hailing originally from Tennessee, he has been touring and performing nationally and internationally for over 12 years, across the U.S. and Canada – with over 1,000 performances. The Josh Gilbert Band members have included a network of friends, family & working musicians through the years who have stuck with him through thick and thin. Adam is from Belmont NC where he lives with his wife Kristen and two children. He has been singing since he was 3 to 4 years old. Adam was saved at age 8, commenting "it was the best choice that I ever made." He said, "I like different types of music, but Southern Gospel is what I love and what I sing. This music just inspires me so much." He has sung in local churches for about 12 years. His singing career has recently taken off, singing with several well-known gospel groups in recent years, including; The Hoppers, Gold City, Michael Combs, The Florida Boys & others, including entertaining on several cruises. "I love to sing and be a blessing to others." For John Lewis, making every moment count is more than just saying it out loud. Whether its mentoring young musicians, spending time with his wife and children, or recording in the studio. John’s heart for God is rooted in his belief that no matter where we’ve come from, we are better when we do life together. John Lewis is a worship leader whose passion is to create a meeting place for God and people with music. He has shared the stage with numerous well-known artists including Sidewalk Prophets, Chris August, Finding Favour, I Am They, and 7eventh Time Down. Influenced early in life by a variety of musical styles such as folk, rock, blues, and traditional hymns, he spent many years developing his abilities as a guitarist and singer, and playing in working bands.